Written on August 22, 2006, and categorized as Secret and Invisible. There is something delightfully humbling about the edges of our knowledge of everything. The brightest scientists attempt to calculate and re-calculate the boundaries of our knowledge by peering inside even smaller and out ever further. I read only two days ago that an extraordinarily intelligent Russian mathematician has apparently expressed in faultless mathematical terms the shape of the universe. I can picture his bearded face from the newspaper. I have been searching since then for something on the internet about it and I can find nothing. Was it a dream, like Charley Barley last night, greeting me with hugs and smiles in a green Somerset field? 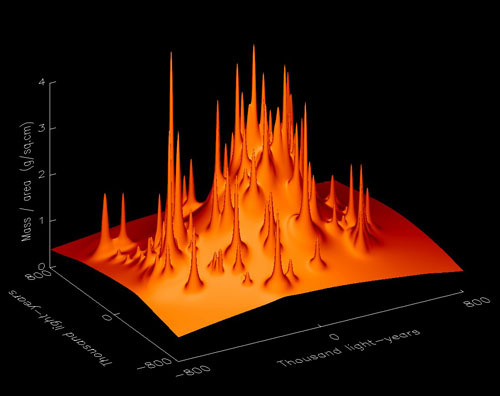 “US astronomers say they have found the first direct evidence for the mysterious stuff called dark matter. 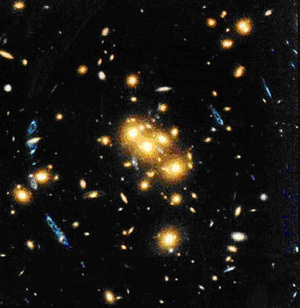 Dark matter – which does not emit or reflect enough light to be “seen” – is thought to make up 25% of the Universe. By contrast, the ordinary matter we can see is believed to make up no more than about 5% of our Universe. Until now, astronomers have only been able to infer the existence of this dark material through the gravitational effects it has on ordinary matter. 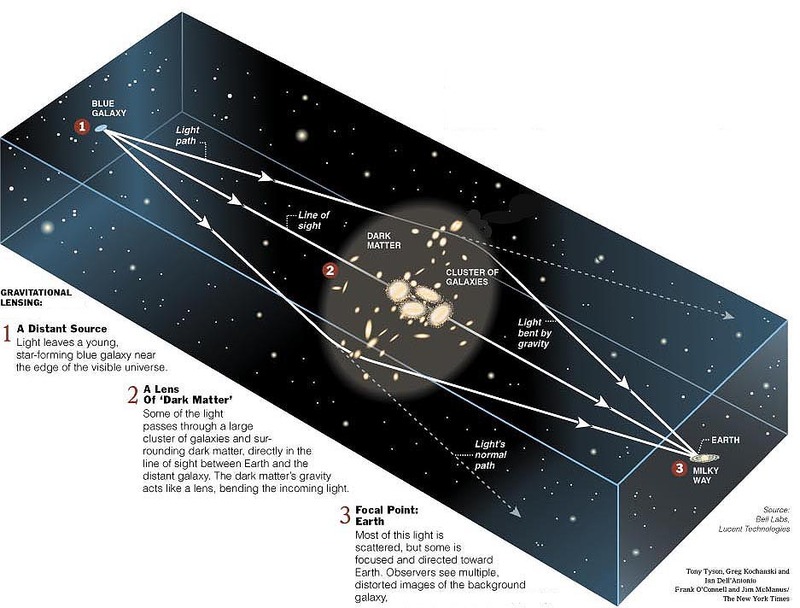 The researchers have discovered what is effectively the gravitational signature of dark matter. I found some gloriously psychedelic (N.B. proper spelling of psychedelic) movies here showing illustrations of strong lensing. I have little grasp of what I am on about. It doesn’t matter because I am only an infinitesmally small part of the 5% of everything and some of us have cornflakes to hatch, legs to oil, sheep to graze. We can’t all be spending time wondering where all the other stuff that must be there is. That is for people like Maxim and Doug, and the Russian scientist whose name I think was Gregor. It makes me deliriously happy that very clever people are doing this work. I can dream easy (about Charley, again, maybe – I miss Charley!) knowing that these these brave pioneers of understanding are explaining the universe. Also, that superbly fit journalists like Paul Rincon are following these matters, and that the mighty BBC which covers everything, world without end, Amen, has included this priceless pearl on its website, so that we can feel a part of the endless Prometheus quest. There is still some confusion about black cabs – it is still not understood how these mysterious entities disappear in the area around Oxford Street at 11pm and re-appear in Chigwell, many miles away, moments later. Scientists looking to increase their understanding of dark matter could do worse than refer to these pillars of transitory wisdom in their search for clues about the way things are. So, this seals the deal for the big crunch, then? I just like the way that diagram looks like a kind of, “cosmic coffin”.